← Fennel, kohlrabi, & peas! Scapes, parsley, favas – hot stuff! This recent heat has everything going gangbusters at the farm, resulting in this fairly heavy share today. Irrigation has been the name of the game for me and the farm recently. Since we’re on city water with pretty low flow, I have to break the farm up into lots of little pieces and irrigate one at a time. That means a lot of little trips back and forth between my house and the farm to switch the irrigation to the next section. It’s lucky I only live one block away! 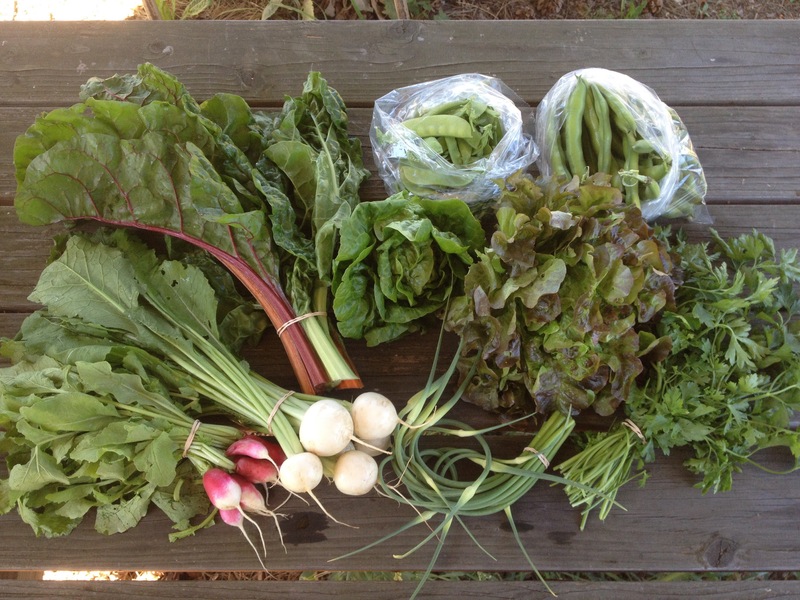 A few new items are in the share today: fava beans, swiss chard, parsley, and garlic scapes. fava beans – We picked these at a fairly tender young stage where you can (if you want to) grill them and eat them whole, pod and all. If you choose to shell the beans out you don’t necessarily have to skin the beans themselves as many recipes call for, being that they are on the young and tender side (though of course you can if really want to!). Besides grilling (with salt and oil of course), you can shell out the beans and saute them. You could also add them to a falafel recipe with or instead of chickpeas. parsley – If you’re making falafel, add some parsley in while you’re at it. garlic scapes – aka “garlic whistles” aka “garlic spears” – these are the tender flower stalks and buds of hardneck garlic plants. We pick them off to direct more of the plant’s energy to the developing garlic bulb (ready for digging in about a month). These are similar to green garlic in that they have a garlic flavor but are much milder and can be used more like a vegetable and less like a spice. The best scapes I’ve had were pickled! Also they are great on the grill. swiss chard – This rainbow variety sustained some heavy leaf miner damage early in the season but seems like it’s doing pretty great anyway. We picked off quite a lot of damaged leaves but still found many nice ones. This is a hearty braising green. The stems take longer to cook so you can remove them or cook them for longer. Chard is a relative of spinach and beets and has similar flavor to the leaves of those crops. Chard is high in Vitamins A and C, and contains a high quantity of antioxidants. peas – a hefty load today – mostly snow but a few snap in there as well. radishes – if they are too spicy for you, peel off the outer skin or roast them (you can cook them with the greens if you like). salad turnips – “hakurei” – One of my favorite spring vegetables due to its versatility and just plain yumminess. Raw or cooked and the greens are great cooked as well.